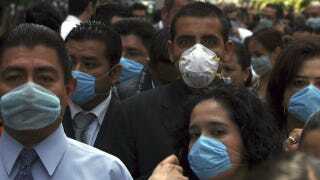 In 2009, swine flu created a minor pandemic, only killing about 15,000 people but infecting millions more. The avian flu H9N2 is ravaging bird populations throughout Asia. They're bad enough on their own...but what if they joined forces? That's the question a team of Chinese researchers have been recently exploring. H1N1 and H9N2 are closely related viruses, capable to swapping genes if they ever find themselves in the same cell. The results of this gene swapping can be entirely new viruses. Many of these will be malformed hybrids that are way less dangerous than their forebears. But there's a serious danger that a few of these crossbred viruses would be way more dangerous than either H1N1 or H9N2 could ever be on their own. The problem is that virologists don't generally go around randomly mixing viruses, so the risk is that the first time these viruses would meet is in the lungs of an Asian chicken farmer. To mitigate that threat, researchers at the China Agricultural University created 127 hybrid viruses and injected all of them into lab mice. More than half the hybrids proved just as infectious as the original viruses, and eight of them were significantly more pathogenic and contagious. Now, mice and humans have different immune responses, so these more dangerous hybrid viruses might not even harm humans. But the viruses do appear to have the ability to swap genes and create much deadlier viruses, and these are two viruses that have a legitimate chance of sharing the same cells. While the creation of such potentially dangerous viruses is controversial, this knowledge could help us anticipate what sorts of strains pose the greatest threats, hopefully allowing us to stop a hybrid virus pandemic in its tracks. Via Proceedings of the National Academy of Sciences.